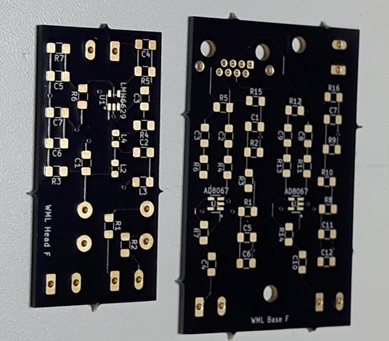 My first experience with third party PCB fabrication was painless, reasonably priced and relatively fast. Oh, and they are much better than anything I could have done myself. Well, I decided to take the plunge and get some professionally made boards for my wideband magnetic loop implementation. This was something I had never tried before. You can see the final products above. The PCB on the left is the head end amplifier board, which is 1″ by 2″ in size. On the right is the base amplifier board, slightly larger and supporting two amplifiers, one for each loop in my diversity system. Both boards are double sided. The circuits were designed in LTSpice and the boards in KiCAD. Third party PCB fabrication used to be quite expensive. You will find that it still costs a lot more than DIY but the quality is an order of magnitude better. You can easily do double sided designs with solder masks and silk screen annotations. Most of the SMD parts are 1206 with a few 0805 inductors. Connections to the boards will be made through screw terminals and also RJ45 for transmission line. Most PCB fabrication is done in China. You can find domestic outlets as well. I found that board costs were lower direct from China, but shipping costs were higher and wait times longer. For my first third party PCB fabrication experience, I selected a well regarded North American supplier, OSH Park in Oregon. Basic orders give you three boards at a price of US$3 per square inch. My boards came to US$9.75 for the head end and US$18.70 for the base amplifiers. Usually, fabricators build boards from customer supplied Gerber and Drill files. Gerber is a format for 2D images. Mostly, these are created for you automatically by whatever software, such as KiCAD, used for designing your boards. OSH Parks goes one step further and accepts your KiCAD PCB files, too. To order from OSH Park I simply uploaded my KiCAD design. One click. OSH Park then checked the designs and gave me a price. The whole process, including payment, took a few minutes. My designs were then sent to fabrication, and ten days later, shipped to me by regular post. I selected the USPS delivery option as it was free and since OSH Park is nearby in Oregon, I figured fast delivery and I was right. The whole process took just over two weeks. Although a bit dated, here is a video showing the entire OSH Park process. Now it’s time to learn hot air soldering.